This Chicken Stroganoff reminds me of being back in college, living in a big house with a bunch of other people, where we all took turns cooking for each other. Though the results were sometimes on the dubious side, it was always interesting. Dishes that featured wine and sour cream were highly featured on the menu rotation for some reason, a trend that was not at all a bad thing in my opinion. And while Greek yogurt is a trendier ingredient these days, I still prefer sour cream in recipes like this one. I had always loved my Mom’s stroganoff, which was made with beef, but the price of beef is edging up to alarming heights lately, so I came up with this idea which still has a lot of the same flavor, but uses boneless, skinless chicken thighs instead of beef. Chicken thighs make a surprisingly good beef alternative – they take a bit longer to cook than white meat chicken does, which gives flavors like these time to meld. 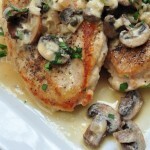 Plus, thighs stay nice and juicy, unlike chicken breasts which would turn dry and tough if you cooked them this long. And while thighs take a little longer to cook, they take far less time than the tougher cuts of beef you would use in a typical stroganoff, so this is a meal that is ready for the table in under an hour, much of that time just simmering away – a huge plus on a busy day. I made this when Lauren and Steve were here recently. They have moved from waaaaay down south, to just a few hours south, which we are very glad about. They were here on and off for a couple weeks while they looked for a new house, and we got to babysit their big lab-hound mix, which made Riley very happy, since he had someone to play with. Now we are all anticipating the arrival of their first baby – our third grandchild. Pretty exciting stuff! 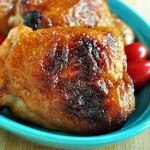 5 - 6 boneless, skinless chicken thighs, trimmed of excess far and cut into ¾ inch chunks. Sprinkle the chicken with the salt and pepper. Heat the oil in a wide saute pan, until it begins to shimmer. Brown the chicken in a single layer for a few minutes on each side - you just want a bit of color on it at this point. You may need to do this in a couple batches. Set the chicken aside in a small bowl. In the same pan, cook the mushrooms for a couple minutes, until the brown a little and give up some liquid. Smash the garlic cloves and mince them up a bit. Add the onions and garlic to the mushroom and cook another minute or two, just to get everything going. Add the white wine and simmer for a couple minutes to reduce slightly. Add the chicken back to the pan, along with the chicken broth, thyme, paprika, and Worcestershire sauce. Mix to combine and then taste to see if you need any more salt and. or pepper, adding a bit if it does. Not too much - you can always add more later. Simmer, covered, for about 35 to 40 minutes, until chicken is very tender. At this point, you want to cook 4 servings worth of wide egg noodles, according to the package directions. Mix the cornstarch and cream in a small bowl until no lumps remain, then stir the mixture into the pan. Keep stirring gently as it returns to a simmer, and the sauce thickens. Measure the sour cream into a 2 or 3 cup bowl [you need room to stir] and mix it until it is nice and smooth. Add about ½ cup of the chicken mixture, a little at a time, stirring all the while. This ensures that the sour cream doesn't curdle and break the sauce. Stir the sour cream into the rest of the ingredients in the saute pan, and warm gently over low heat, stirring very frequently. You want it to be very warm, but don't let it boil, or it might separate. 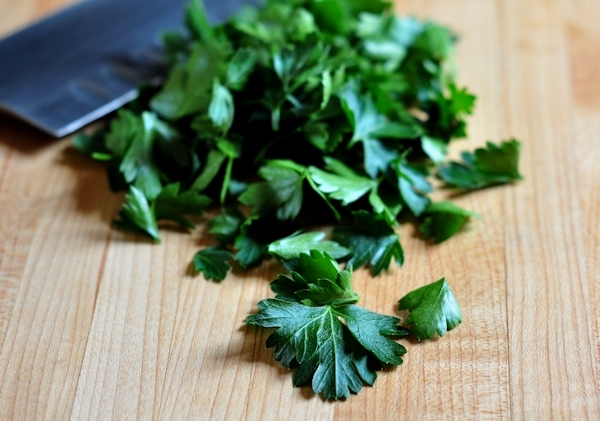 Serve over warm egg noodles with some chopped parsley for garnish. It is warm and satisfying and definitely company-worthy. Well, our company certainly thought so! 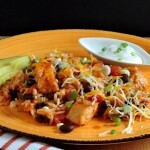 Hands down this is one of our favorite dinners… cant wait to try your recipe! I hope that you enjoy it Pamela! Thanks Renee – hope that you enjoy it! 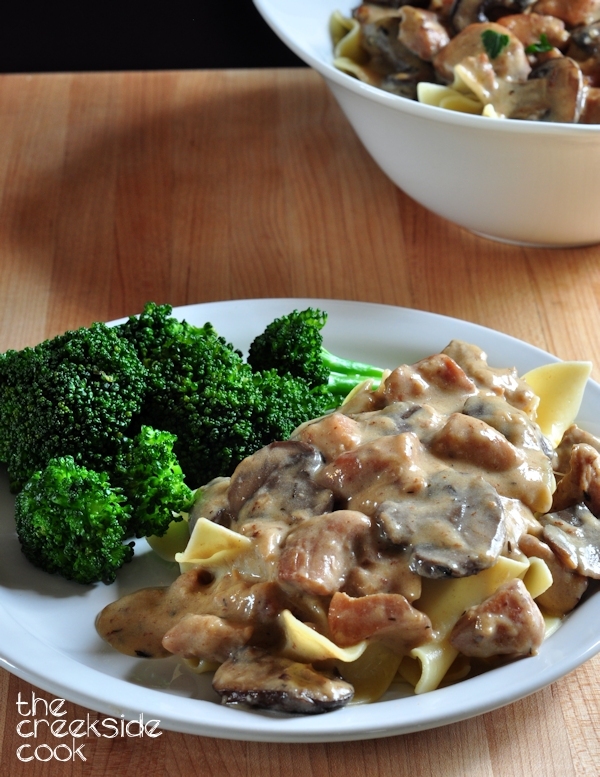 I have never tried chicken stroganoff, just the beef that my mom made when I was growing up. This looks delicious and healthier than her version. Can’t wait to make it! Thanks – I had always used beef too Kristy, but I almost think we like this better! What a great idea using chicken instead of beef and I’d imagine chicken thighs would be perfect too for the reasons that you said 😀 And sour cream all the way too (unless I’ve had a series of overeating days)! LOL Lorraine – I agree! Third grandchild? How wonderful! And this casserole? Delicious. Thank you for sharing! 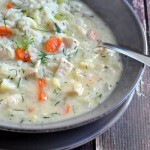 Scrumptious and so comforting! A wonderful dish. 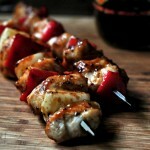 I’m pinning this recipe right now, so I don’t lose it! I’m just starting to learn how to cook and this looks easy enough even for me. thank you thank you!!! I am glad that you like the recipe Ami, and I think you will find it easy to make – let me know if you have problems or questions! I don’t think I’ve ever had Chicken Stroganoff! And it’s been ages since I’ve had the beef variety. This looks terrific — I think I like it better than the beef version. Thanks for this. Thanks John & thanks for visiting today! So funny that you should mention in the story that this dish reminds you of college. 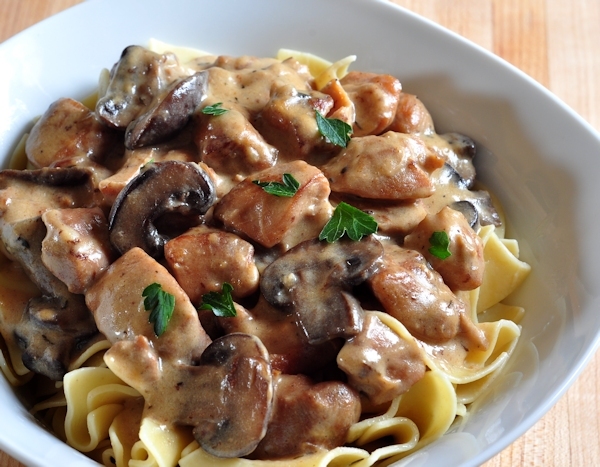 I used to make stroganoff all the time in Uni, although I had a vegetarian version as I was a vego at that stage. 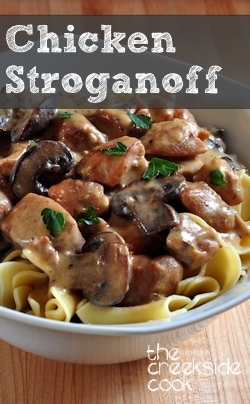 I have never tried a chicken stroganoff but I can imagine that its delicious. 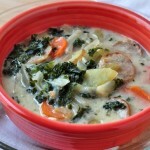 Hi Julie – glad to see I am not the only one with fond memories of this kind of dish! Oh, but this does remind me of being back in school too! Some dishes sure stand the test of time. This one sounds delicious. I love the idea of chicken thighs. They are so flavorful. I agree Adri – though chicken breasts are handy if you are in a hurry, thighs have way more flavor and don’t dry out easily. Love them! You have grandchildren? I had no idea – you must be a young grandma! I’ve tried beef stroganoff a few times (never made on my own, but I should!) but not with chicken. 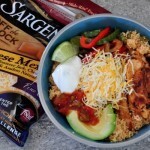 I think my kids would like this a lot and great for lunch next day too! Thanks Kumar and thanks for stopping by! Un gran post, nos has hecho recordar la receta del stroganoff, hacia mucho tiempo que la teníamos olvidada. Thanks for your kind words and it is so nice to meet you! I made this last night and we are having the leftovers today! This was wonderful. I also liked how detailed your directions were. Just one quick question….can this be frozen for future meals? I’m so glad to hear that you enjoyed one of our family favorites! You can freeze this, but what might happen when you thaw it out, is that the sour cream may curdle a little. What I do is, if I know there will be enough to freeze, is to take out the part I plan to freeze before I put in the sour cream, and then add it right before serving. If you do freeze it with sour cream, and it curdles, you can sort of repair it by adding another 1/4 cup of sour cream in the same manner as described above. It won’t un-curdle it, but it will make it creamy again and kind of cover up the curdled appearance, which tastes absolutely fine by the way – it is just doesn’t look as nice. Hope this helps! I am a Muslim and would love to try this, so is there any chance that I can skip the white wine? Are there alternates to the wine?